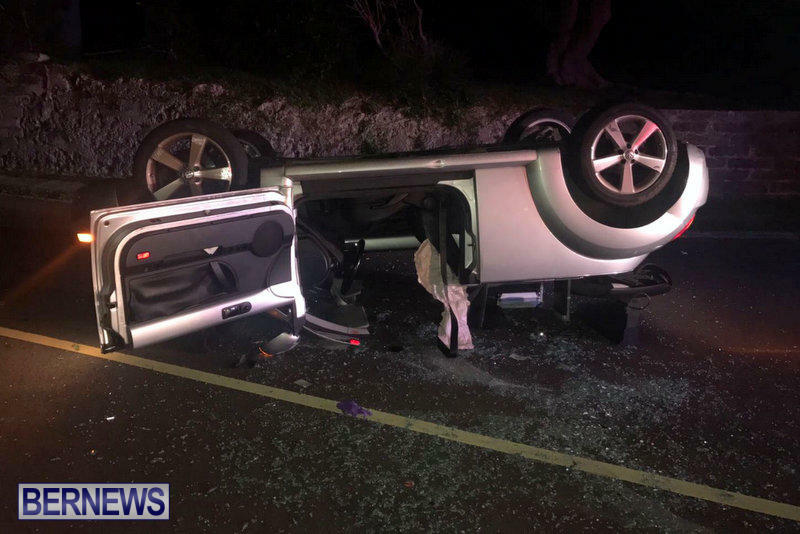 [Updated] Emergency services responded to a report of a collision on South Road, just west of Brighton Hill in Devonshire, at approximately 10.15pm tonight [Oct 11]. On arrival we understand they found a car overturned in the road with a person inside. Unofficial reports indicate the person had to be assisted out of the vehicle. Bermuda Fire and Rescue Service and ambulance personnel were on scene together with police. Details are limited at this time, however we will update as able. 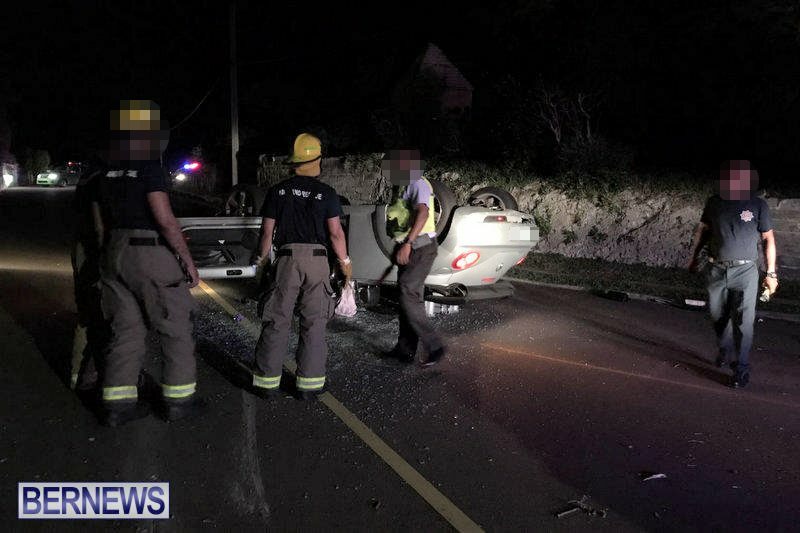 Update 11.37pm: A police spokesperson said, “Around 10:15pm Wednesday, October 11th police and first responders were dispatched to a reported single car crash on South Road in Devonshire near the junction with Brighton Hill Road. “The vehicle involved overturned and the driver, believed to be a 64 year old Hamilton parish man, was apparently treated at the scene by EMTs for minor abrasions. Update October 12, 12.30pm: A police spokesperson said, “Around 10:15pm Wednesday, October 11th police and first responders were dispatched to a reported single car crash on South Road in Devonshire near the junction with Brighton Hill Road. “The vehicle involved overturned and the driver, believed to be a 64 year old Hamilton parish man, was treated at the scene by EMTs for minor abrasions. “He was then taken to King Edward VII Memorial Hospital via ambulance for further medical assessment and later discharged. I’m sure he was only doing 25mph. SAFE DRIVING FOR EVERY ONE . To lessen the burden on the big three insurance companies. I am surprised that the principal insurer don’t sell a percentage part of the risk to the other two agencies, this may help to reduce the cost of premiums. In the bargain this will also improve the driving habits of those of record no care drivers, there is more to insurance that a few scratches and a paint job, large third party personal injury claims can be devastating . Some how Sorry ! does not work any more. How on earth do you flip a car? Especially there? Someone else had to be involved who fled the scene, someone who made this guy swerve and flip. nothing else makes sense. hope all are okay though. I was waiting for this to happen. Its a serious design flaw in the road. There is a long straight and the road widens with no markings on the left to show where the edge is. It’s right in front of the vegetable stand. At the end, where the road returns to normal width, there is a private property with a sharp rock incline.I’ve seen so many drivers drift to the left then swerve right when they see the hedge. One person even drove on the grass! I’m willing to bet this poor man didn’t swerve. Is road paint too expensive for there to be markings warning drivers of drifting? Quite right. It’s never the fault of the driver, always someone else’s fault.